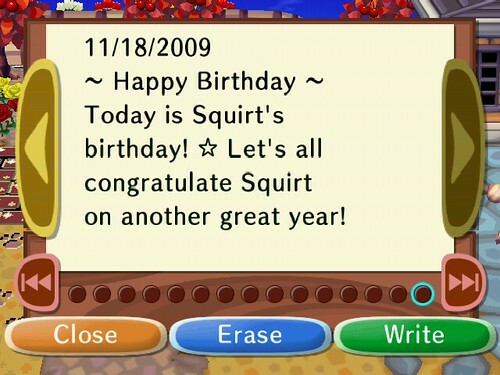 As expected, King Squirt’s birthday was on the 18th! Don’t worry, you didn’t miss the party – King Squirt’s Birthday Party is on 11/22! I created a Facebook event for the party, but if you’re not on Facebook that’s ok! I’ll post party info at the bottom of this blog. 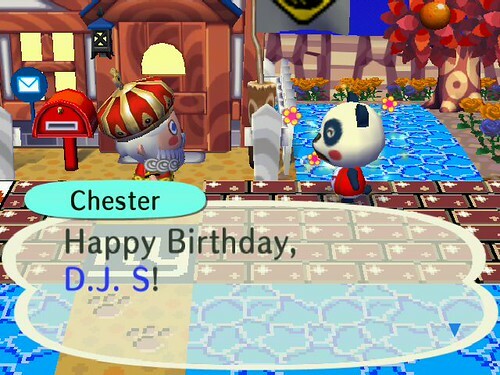 I was somewhat surprised that Chester was the one delivering the cake to King Squirt. I had assumed it would be Rowan, since he’s been around for quite a while and Squirt is always nice to him. But I suppose being next-door neighbors with Chester helped them to become fast friends! 5 PM EST: Open for an hour before dinner time. Expected visitors *might* include a new friend, Marissa from Arcadia! 11PM EST: Open for my late-night regulars! Expected visitors *might* include Miao, Vella and Hery! INTERNATIONAL FRIENDS PLEASE NOTE: Recently the USA began “Daylight Savings Time.” This means our clocks went back one hour. Here are the time conversions for the Eastern Time Zone: UK is +5 hours, NL is +6 hours and JP is +14 hours ahead!